Can you tell from the title of this posting that I am VERY excited about the recipe? I have been a little under the weather and didn’t want to prepare anything too labor intensive, there’s a page in my Redbook Magazine with modified Pad Thai recipe, I’ve been eyeing it but had no idea what consists of “Pad Thai Sauce”. After digging around online, the following recipe seems super easy with good reviews. I am posting the modified ingredients/steps, the finished dinner was SO YUMMY! Initially hubby complained I gave him too much, but he ate the whole bowl after tasting it, hope you and your family enjoy too! Heat oil in a wok or large heavy skillet. Toss in most garlic and half of the green onions until fragrant, then add in and saute shrimp quickly. Remove when shrimp are halfway done, and set aside. Heat oil in wok over medium-high heat, toss in the rest of the garlic and most of the green onion, crack eggs into hot oil, and cook until firm, remove from fire and set aside. Add softened noodles, and vinegar, fish sauce, sugar and red pepper. Stir for about 1 minutes then add the shrimp also eggs back in. Mix while cooking, until noodles are tender. Add bean sprouts, and mix for 3 minutes. Serve the noodles in a big bowl, add some crushed peanuts on top along with the left over green onions. Enjoy! Here is another shot of the dish. I love Pad Thai. I really really do. I’ve tried making it with several recipes but haven’t found the one I liked yet. I must try yours! Thanks for sharing! Nami, the family really enjoyed this recipe, though I am not a Thai food expert, only know it was tasty to our taste buds. If you do give it a try, I’d love to hear your feedback! 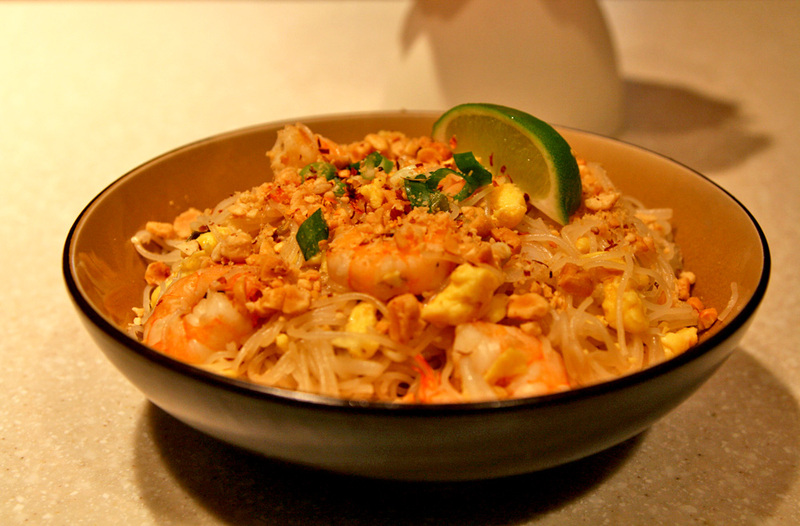 My wife and I love Pad Thai, but like the other comment finding a recipe I love is hard to do. Your picture looks like the Pad Thai I love, so I am going to have to try this. Thank you for posting a great picture. Welcome Alex! Thank you for the compliment! 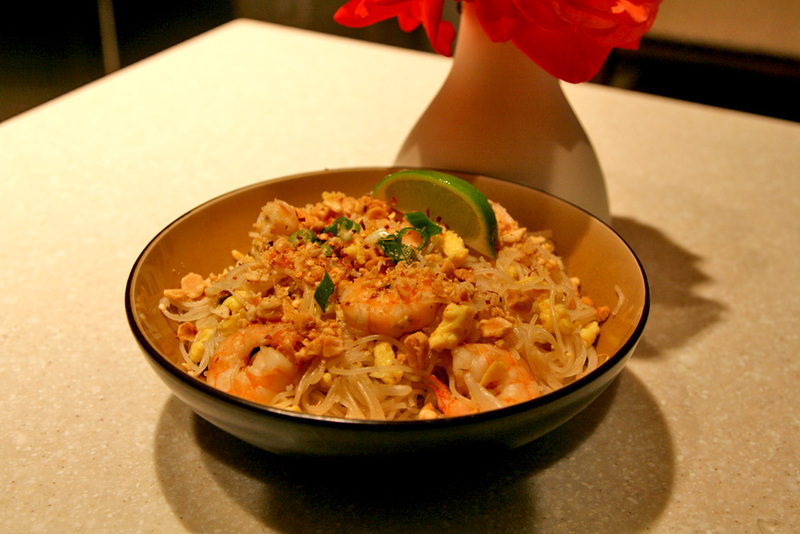 I try to find recipes that are not too difficult to create, and this pad thai was definitely something that’s easy yet tasty. Please let me know how it works out for you and your wife, she’s a lucky gal to have a husband who cooks! BTW love the photos of your babies and puppies!